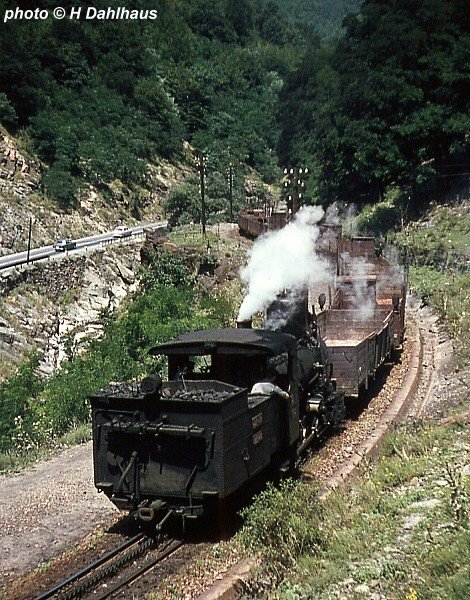 I made my first visit to the rack operated section on August 8th 1966. The rack section was between Bradina and Konjic. Originally 18.8 Km had been rack worked but a realignment and new tunnel between Pazaric and Tarcin, finished in 1935, had reduced this to 8 Km. The rack section in its final form was upgrade to Sarajevo and downgrade to the coast. The new tunnel of 1935 is now used by the standard gauge line. 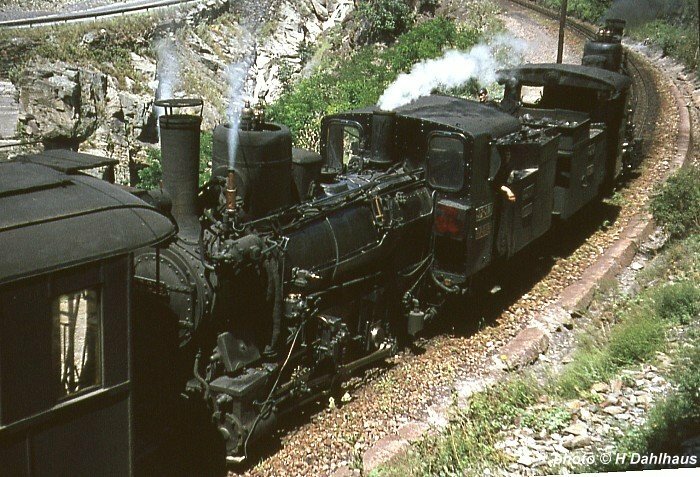 All traffic was worked by the four cylinder rack and adhesion Class 97 0-6-4's. 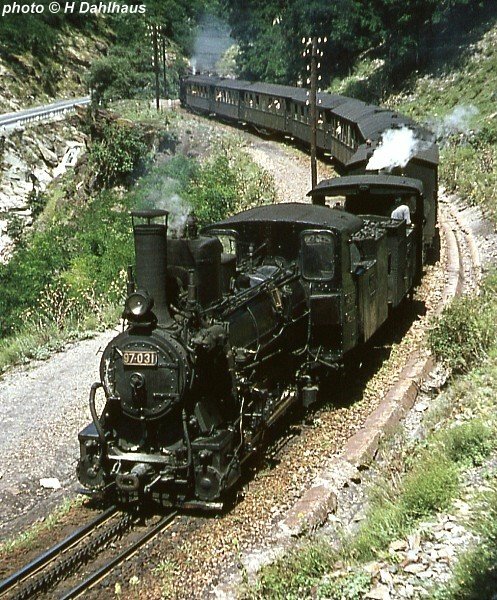 The Austrian builders Floridsdorf supplied 38 locomotives of this class between the years 1894 and 1919. The 97's had independent sets of cylinders and motion for the adhesion and rack drives. 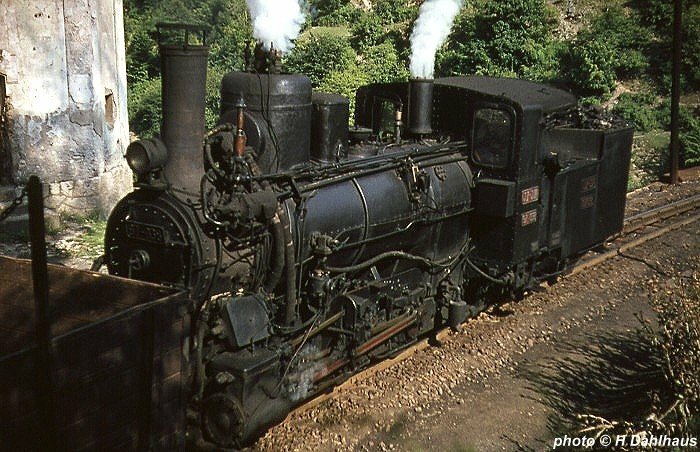 Each engine also had two regulators and two sets of reversing gear so keeping them in unison when double-heading was a highly skilled task. As we waited for train B6 (Brzi Voz = express train) from Sarajevo Novo (depart 08.24) to Dubrovnik (arrive 18:25), this goods train appeared heading up the gradient. Unfortunately I only managed a photo of the banker 97-025. 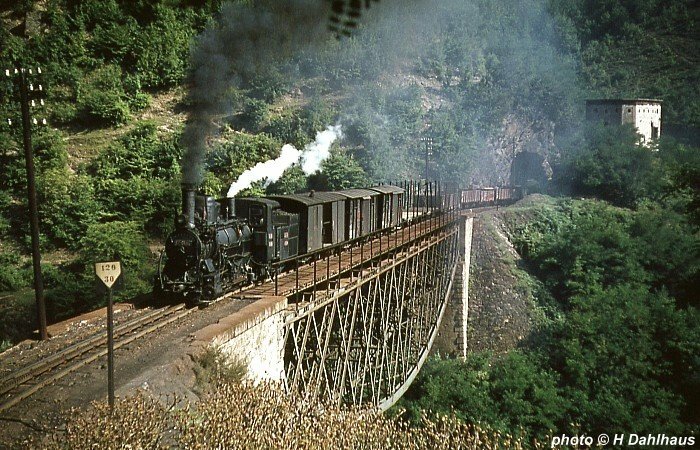 B6 had probably waited for the crossing with the goods train in Bradina, because soon after the typical noise of working counter-pressure brakes was to be heard. Here the express train rolls past heading downhill. 97-031 and 028 led the train, with 97-019 and 006 at the rear. 97-019 and 006 at the rear of the Dubrovnik express, August 8th 1966. 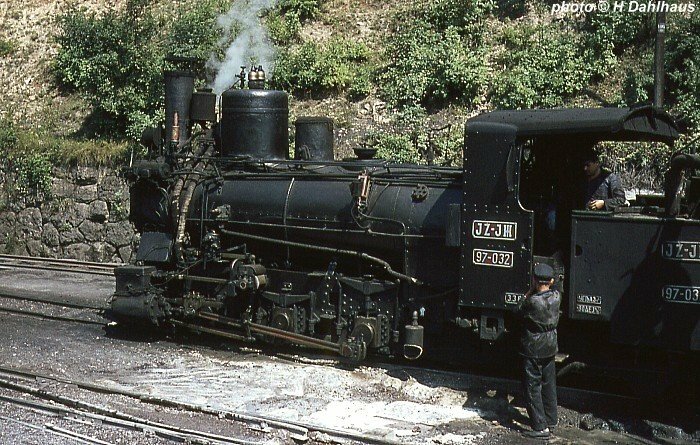 Two views of 97-032 at Brdani pod Ivanom on 10th August 1966. All Sarajevo bound trains stopped here to take on water. 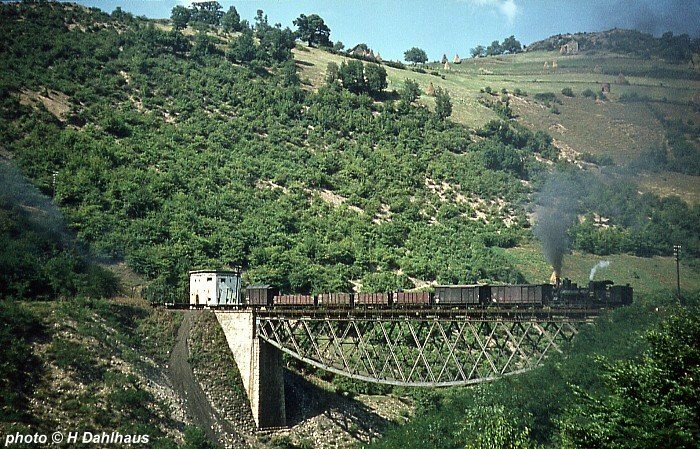 97-013 on the front of a freight for Sarajevo is crossing the famous bridge over the Luka ravine. While 97-019 is banking at the rear, 10th August 1966. When we inspected the bridge more closely, we had doubts as to whether it would be a good idea to cross it to go to the other side. The bridge timbers were showing signs of wear no doubt because of the imminent closure of the line. However we risked it - "Everything for a good picture!". We were rewarded with this goods train headed by 97-014.
and banked at the rear by 97-038. 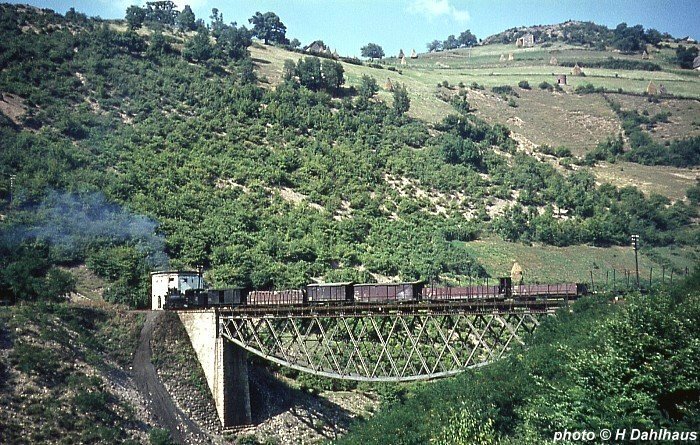 On the way back to Brdani pod Ivanom we photographed this goods train with 97-013 and 032, rolling down the valley towards Konjic. 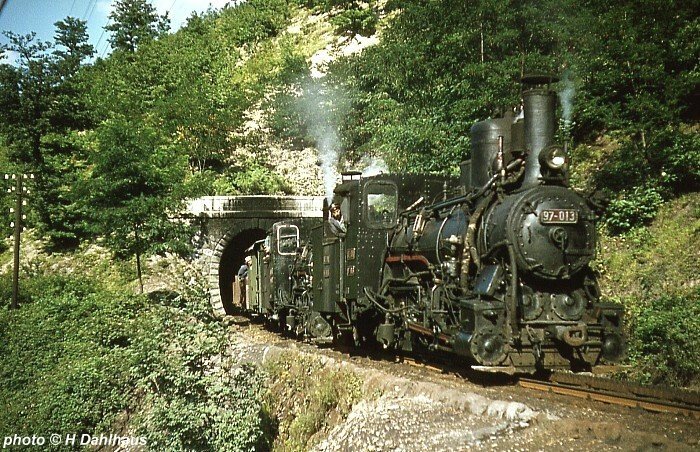 Only 3 months later, on November 5th 1966, the last narrow gauge train ran from Ploce to Sarajevo and the long reign of the Class 97's over the Ivan Pass had ended forever.